Meat eater? Fan of cheese? Looking for something a little different & a lot delicious? 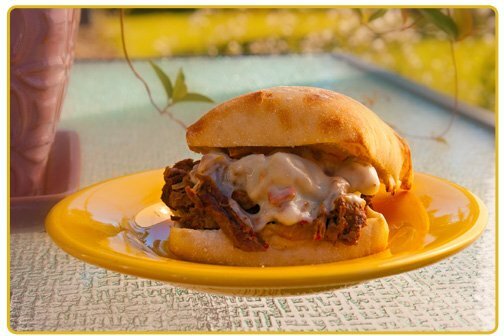 Here’s a southern twist on a Philly Cheesesteak sandwich recipe. Prep. time: 25 minutes. Cost: Less than $20. Serves: 6. Add the steak to the slow cooker. Mix the pepper, salt, garlic, broth, & Worcestershire sauce in a small bowl then pour over the meat in the slow cooker. Melt the butter in a large frying pan. Sauté the onion & all the peppers together until browned. Add the vegetables, including any drippings, to the slow cooker. Toast the bread rolls when nearly ready to serve. Stir the ingredients in the slow cooker then use a slotted spoon to serve onto the bread rolls. Please keep in mind that cooking times may vary so the first time you make a recipe, keep an eye on the slow cooker. You may need to adjust the amount of cooking time. 4 Responses to "Kickin’ Carolina Cheesesteak"
Hi Kristy! Now you’ve got me wanting cheesecake. 😀 LOL. I think it’s delish. Let me know what you think if you give it a try. Cheers, darlin. Looks yummy. With my busy schedule I really should use a slow cooker. Like every day. haha!! Thank you for the recipe!